The "twins" of Twins Crew are brothers and guitarists Dennis and David Janglov. The rest of the "crew" is Andreas Larsson (vocals), Fredrik Hammar (bass) Uno Eriksson (drums) and Nicko DiMarino (keyboard), the last member coming on board in 2013. After a short three year hiatus, Twins Crew returns third long player, Veni Vidi Vici. The title, of course, comes from that Latin phrase attributed to Julius Caesar, after defeating Pharnaces II of Pontus in a short war at the Battle of Zela. 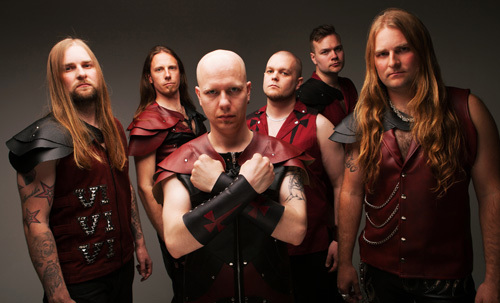 Yet, the title may be a heavy metal battle cry for Twins Crew, wanting to step up their game and conquer the power metal world. The certainly have the talent and skills for the job. Strong, sharp, and abundant riffage. Roaring twin guitar harmony, and feisty leads. Being formed by two guitarists, Twins Crew and their sound is definitely guitar-centered. The bullet train speed of traditional power metal, from a rushing and ravaging rhythm section. And Andreas Larsson is classic metal singer, going from gruff to soaring to screamo as called upon. There's an added nuance in slightly more present keyboards (Sky Is Falling, by example), including some Hammond organ. As for the songs themselves, they're mostly a rush of speed, roaring riffs, and flaming guitar solos. A few songs trick things up. One, Ghost Of The Seven Seas, treads along a path of more moderately paced heavy metal, with nuanced symphonic flavor. Praise Hell is another that dials back on the speedy tempo, going for a more deliberate pace. Unfortunately, until you get to the guitar solos in the later third, the song is kind of sluggish and cumbersome. Burn The Witch starts with lighter electric guitar, offering one of the calmer starts and moments within the entire album. All in all, with Veni Vidi Vici, Twins Crew definitely nails the power metal genre with enthusiasm and skill for entertaining results. If your a "true" metal fan, you will like this album. Recommended. 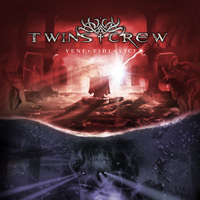 With Veni Vidi Vici, Twins Crew definitely nails the power metal genre, with enthusiasm and skill, for entertaining results. If your a "true" metal fan, you will like this album. Recommended.